These units form the basis of the Land Systems of Victoria, and are currently under review by the Geomorphology Reference Group. The geomorphic units that form the basic components of the land systems of the Corangamite region are listed in the Table below. 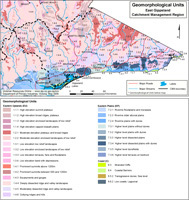 This map provides an overview spatial representation of the geomorphic framework - down to the third tier level.